Sporting an uncanny resemblance to a shark, LDN 1235 is most likely an extended red emission nebula (ERE). EREs shine by photoluminescence when dust particles are hit by high energy radiation. Also shown in this image are two reflection nebulae, van den Bergh 149 (vdB 149) and vdB 150. These blue nebulae can be seen on the left side of the Dark Shark at top and bottom, as shown in the annotated version of this image. 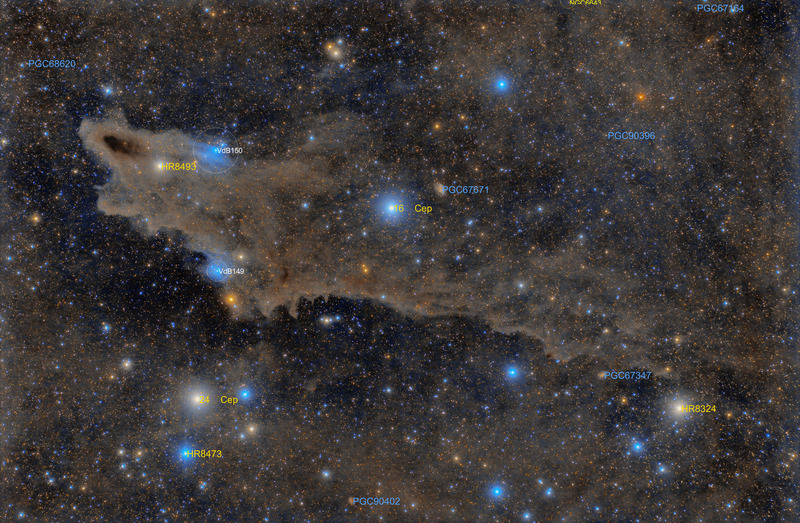 This image shows a section of sky roughly 3.3 x 2.2 degrees. In this image, North is Up. Software Used Images Plus 5.75 for camera control, calibration, and stacking. Images Plus 6.0.5 for DDP stretching, star size reduction, smoothing and noise reduction, feature mask, masked stretch, color channel splitting and recombination. Photoshop CS5 used for levels and curves, screen mask invert, high pass filter, lab color, saturation adjustments, selective color, and match color. Gradient Xterminator for gradient removal. Carboni Tools for additional noise reduction and smoothing. HLVG for additional color correction. Registar 64 for subexposure alignment and color channel alignment. Pixinsight 1.8 for automatic background extraction, color calibration, histogram transformation, multiscale median transformation, morphological transformation, exponential transformation, local histogram equalization, dark structure enhancement, and image annotation. Notes I so enjoy imaging these dark and faint nebulae and LDN 1235 certainly did not disappointment me. The Dark Shark has some beautiful colors throughout the field, and I'm very happy with the details I was able to retain within the nebulosity. This image was published by Astronomy Magazine as its Picture of the Day for November 13, 2015! !